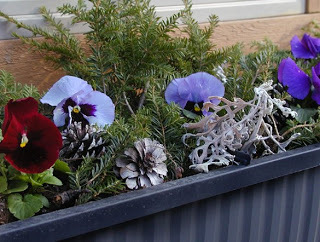 Spring fever has hit us hard (yes, Brigette is counting down the days until Spring…36), and so we’ve added some cute blooming pansies to the Lake House windowboxes, along with some greenery, as the dusty millers and vinca from the previous year work on waking up. We’ve also been working hard on our “Almost Spring” project of redecorating the solarium with new tables and chairs, light fixtures and additional plants. We’ve got some really creative ideas for the new tables, which we can’t wait to share with you when Springtime gets here. The chairs are set to arrive next week, so we’re excited about that. (For our past guests who really like the tile tables, no worries, we’ll be placing them in a new spot). To round out the solarium “Almost Spring” project, Dave picked up a super comfy bench just today, perfect for lounging in the solarium and watching the buds appear on the trees, the birds at the feeders and the Spring plants popping up. Can you tell that we’re bound and determined to bid adieu to Winter and to welcome Spring to the mountains? This entry was posted in Uncategorized and tagged improvements, Winter by Inn on Mill Creek. Bookmark the permalink.